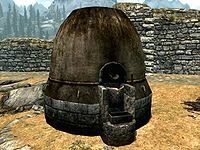 Skyrim provides the ability to smelt ores that you have mined, transforming ores into ingots. Smelting is done in a smelter, which is typically in the shape of a very large, dome-shaped oven (see picture at right). 22 smelters in total are found in Skyrim, all of which are shown on (map), as well as 5 smelters found on SolstheimDB. There is also a category listing these locations. If you have Hearthfire installed, it is also possible to construct additional smelters at any homes you have built. You can place one outside and one in the cellar, if it has been constructed. 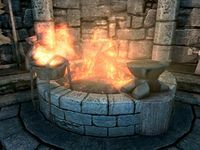 The Myrwatch Creation adds a smelting pot, which is stirred like a cooking pot but is in fact a smelter. Ingots (bars) of materials are made using single, or combinations of ores at the smelter. Dwarven metal ingots are not crafted from any known ores or ingots. Instead, they are made from melted down dwemer metal scraps found in most Dwarven Ruins. The scraps yield different numbers of ingots, as listed in the following table. For more information, see Dwarven Metal Ingot. Occasionally, when you activate the Smelter, the animation will not start and you will not enter third-person view if you were in first-person view. When this happens, you will instantly crash upon smelting anything. The workaround is to exit the smelting interface, wait a few seconds, and then try again. ?